Send questions to John Haigh at john.haigh@ed.gov. More and more students enrolled in career and technical education (CTE) are earning industry certifications, but CTE leaders don’t always know whether their students are earning these certifications. 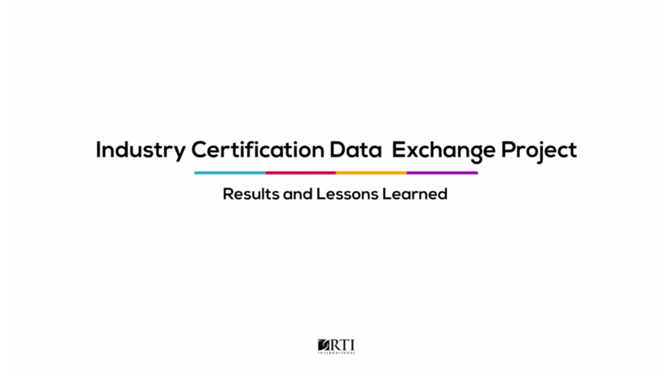 Between 2012 and 2017, the Certification Data Exchange Project (CDEP) took the lead on pilot testing a data exchange process to learn how data from third-party industry certifying agencies could be shared and matched with data from state education and workforce agencies. This video describes the CDEP’s results and lessons learned and describes next steps for states interested in conducting similar data matches.